Anthony Boyd serves as a role model for many first-generation college students at the University of Illinois Springfield. The Chicago native and business administration major is the first person in his family to attend college. Now, as a junior, he mentors two underclassman as part of the Necessary Steps Program, a program designed to assist students transitioning from high school to college. At UIS, Boyd is president of the Upsilon Xi Chapter of Alpha Phi Alpha Fraternity Inc. where he helps organize community service, educational and social events on campus. He is also a member of the Black Male Initiative and works as a front desk clerk for UIS Records & Registration. As vice president of the Black Male Collegiate Society, he runs meetings and coordinates special events. The group meets weekly to bond and show their support for one another. Boyd says he’s learned many lessons about leadership at UIS. Following graduation from UIS, Boyd plans to work in the business field or become a Chicago firefighter. Melissa Mlynski of Chatham has been named Senior Director of Human Resources at the University of Illinois Springfield. She has served as executive director of the Illinois Labor Relations Board since 2012, with a total of 16 years of experience in public service. At the Illinois Labor Relations Board, she issued hundreds of written rulings in labor dispute cases and represented the agency before the Illinois General Assembly in appropriation hearings. Mlynski has been teaching at UIS since 2010 as an adjunct professor in the Public Administration program. She teaches graduate courses focusing on collective bargaining and labor arbitration. Prior to becoming executive director at the Illinois Labor Relations Board, she served as Labor Relations Counsel for the Illinois Department of Central Management Services. Mlynski is a lawyer who earned her Juris Doctor from the University of Illinois at Urbana-Champaign College of Law in 1998. She also holds a bachelor’s degree in English from the University of Illinois at Urbana-Champaign. Mlynski’s employment begins on December 16. She replaces Laura Alexander who left the university earlier this year. Tyshianna Bankhead has big plans for her future, which are fueled by the leadership opportunities she’s received at the University of Illinois Springfield. Bankhead, a senior sociology/anthropology major, is a student ambassador for UIS Admissions, co-president of the African Student Association, secretary of Girl Talk, a member of The Research Society at UIS and a Model United Nations delegate. However, Bankhead is most passionate about dancing. She is president of the Epic Praise for Christ Dance Team and co-president of the Afrobeat Dance Crew. Bankhead recently performed with both dance teams at the UIS International Festival, a cultural festival attended by hundreds of people. The teams have been preparing for months. “We meet every week, once a week, and then we practice our dances in our rooms, we practice them together. It’s dedication,” she said. Following graduation, Bankhead plans to continue dancing and hopes to open her own community center and praise dance studio in her hometown of Rock Island, Illinois. She says it wouldn’t be possible without the opportunities she’s had a UIS. “We follow Leadership lived for life. We have time to go out and experience being a leader on campus and then we graduate and are leaders in our community,” said Bankhead. Richard Gilman-Opalsky, associate professor and chair of the Political Science Department at the University of Illinois Springfield, has published his fourth book. “Specters of Revolt: On the Intellect of Insurrection and Philosophy from Below” argues that the world is haunted by revolt, by the possibility of events that interrupt and disrupt the world, that throw its reality and justice into question. Gilman-Opalsky develops a theory of revolt that accounts for its diverse critical content about autonomy, everyday life, anxiety, experience, knowledge, and possibility. The book examines a timeline from 1848, when Karl Marx declared that a communist specter was haunting Europe to the 2008 Greek revolts and present day uprisings in Ferguson and Baltimore. 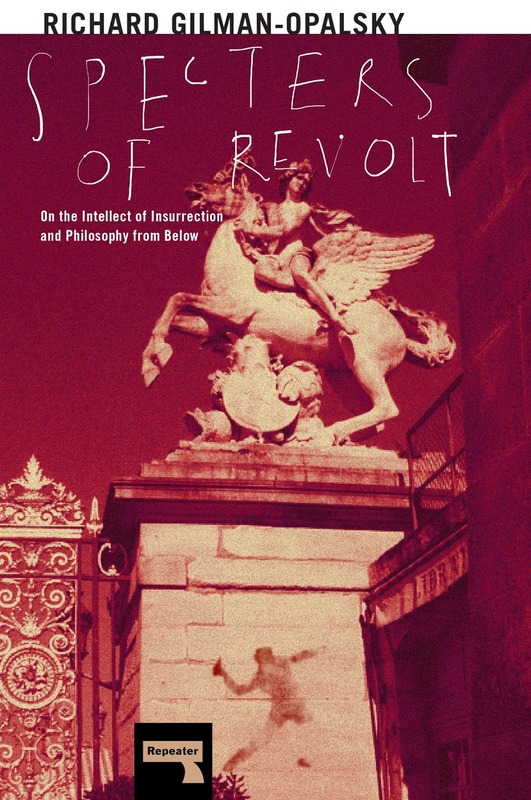 In light of recent global uprisings, Gilman-Opalsky, aims to move beyond the critical theory of revolt to an understanding of revolt as theory itself. The book was published by Repeater Books and is available for purchase from Amazon, Barnes & Noble and other websites. Three University of Illinois Springfield Computer Science majors have finished in the top 20 percent of 3,070 competitors in the first of three National Cyber League (NCL) annual competitions. Austin Bransky of Marengo, Illinois; Paula Kawal of Black Diamond, Washington and Dennis McDonald of Payson, Illinois are competing against other students from across the country. During the competition, students defend systems from real-time network attacks, learning how to find the attacks in system logs, traffic captures and much more. The students use NCL-sanctioned gymnasiums, virtual learning environments located throughout the U.S. that are comprised of systems-integrated software and hardware, to practice and develop their skills. The games are performance based to measure a player’s strengths and weakness among learning objectives. The competition utilizes certified ethical hacker objectives, such as open source intelligence, traffic and log analysis and wireless security. The National Cyber League was founded in May 2011 to provide an ongoing virtual training ground for collegiate students to develop, practice, and validate their cybersecurity skills. For more information, contact Janis Rose at 217/206-8246 or jrose2@uis.edu. University of Illinois Springfield senior Kendra Baber was honored with the Student Laureate Award from the Lincoln Academy of Illinois on November 12, 2016, at the Old State Capitol in Springfield. Baber, a Normal, Illinois native, holds a 3.99 GPA and is majoring in history with a minor in secondary education. She is a member of the Capital Scholars Honors Program and has made the dean’s list every semester she has attended UIS. At UIS, she is president of the History Club and mentors fellow students through the Capital Scholars Honors Program. She volunteers with Dance Marathon, an organization that raises money for the Children’s Miracle Network, and works at the Cox Children’s Center on campus. Baber previously served as Alternative Spring Break vice president and has participated in three trips during her time at UIS. Most recently, she traveled to New York City where she worked to fight hunger and homelessness by volunteering at soup kitchens and related service agencies. During her first two years at UIS, Baber served as the Hunger and Homelessness Committee Chair for the Leadership for Life service organization. She coordinated the Oxfam Hunger Banquet on campus and planned a dinner with Kumler Outreach Ministries that fed over 90 in-need or homeless members of the Springfield community. The qualities she has learned at UIS have inspired her to volunteer off campus. During the summers of 2014 and 2015, she worked at the Mom and Me Camp, a camp for children with mothers in prison. Children are allowed to spend time with their mothers and participate in a variety of fun activities. “Without my involvement with organizations at UIS, I would never pushed myself to participate in such a life-changing experience,” said Baber. Following graduation from UIS, Baber plans to achieve her lifelong goal of becoming a middle or high school history teacher. “I have always wanted to be a teacher, but my studies at UIS have allowed me to feel prepared to make my dreams become a reality. Due to my education at UIS as well as my natural passion of teaching, I feel as though I can become a trustworthy, positive role model for my students,” said Baber. 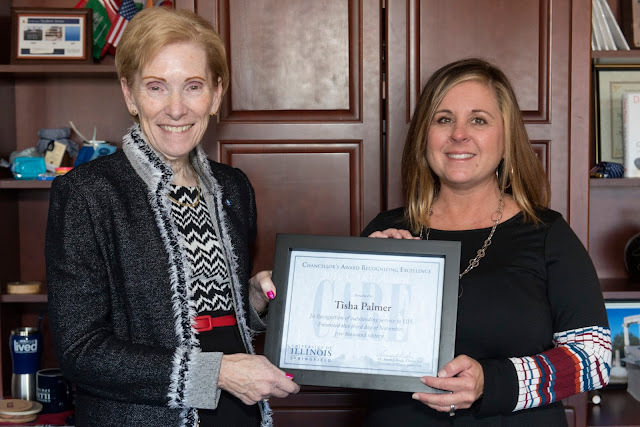 Tisha Palmer, administrative aide to the Vice Chancellor for Student Affairs, has been awarded the 2016 Chancellor’s Award to Recognize Excellence in Civil Service (CARE). The award is the highest honor annually awarded to a Civil Service staff member at the University of Illinois Springfield. Chancellor Susan J. Koch announced the winner of the award during a breakfast on November 3, 2016. She also thanked all civil service staff members for their dedication to UIS. Palmer has worked at UIS for 26 years, starting in the Sangamon State University Foundation Office, then transferring to the Office of Business and Financial Services (OBFS) in 1997. She has worked for the Vice Chancellor of Student Affairs since 2006. As her nominator put it, Palmer is “the face of student affairs”, known for her positive attitude and deeply caring about the students she assists. Palmer regularly volunteers at student events, such as homecoming and Springfest, and participates in volunteer service events. The CARE award was handed out as part of the 10th annual Civil Service Appreciation Day, which honors the over 300 civil service employees at UIS for all of their hard work and dedication. This year’s celebration included a variety of door prize drawings. The winner of the CARE award receives $500, plus a $500 donation made to the campus organization of his or her choice. As president of the Student Government Association (SGA), Austin Mehmet often serves as a voice for all University of Illinois Springfield students. It’s a position that’s taught him a lot about leadership and responsibility. “I think it’s taught me a lot about how to work with others, about teamwork, and how to delegate authority to particular people,” he said. Mehmet, a senior computer science and legal studies major from Springfield, is set to graduate in May and already has a software development job lined up with State Farm Insurance in Dallas, Texas. In addition to his SGA role, Mehmet is a team captain on the mock trial team and a member of the Model Illinois Government Moot Court. “College is what you make of it and as you become more and more engaged on campus, you gain more and more value from your college degree,” he said. Out of all of his leadership roles, Mehmet is most passionate about being a voice for students. He worked his way up to the SGA presidency, starting as a senator and then treasurer. Mehmet says he will leave UIS feeling well prepared and ready to start his future career.